Lima was the location for Liz and Matthews wedding so a Peru Passport Invitation was an obvious choice. In traditional Maroon and Gold the finished design looked great (even if I do say so myself). Liz and Matthew had a good idea of what they had in mind when they first contacted me. The wedding was to be in Peru and they were keen to encourage guests to join them for their big day and have a holiday at the same time. A gorgeous picture of the famous Machu Picchu was used for the background along with some greats pictures the couple had taken for their engagement. Liz and Matthew also created a wedding website which their guests could use to find out more details about the wedding. If you haven't considered a wedding website yet I'd strongly recommend you look into it. Click here for more details about what they are and how easy they are to create. "I am originally from Peru and my fiancé and I will be having our wedding in Lima. I kept looking for invitations online that would resemble a passport but still gave me the opportunity to incorporate my ideas. I found Kate's website and it was more than I could expect. She really used her design and gave me advise on what would work best. When we received the invitations we were very, very happy!. We can't wait to mail them out this week and share with friends and family. 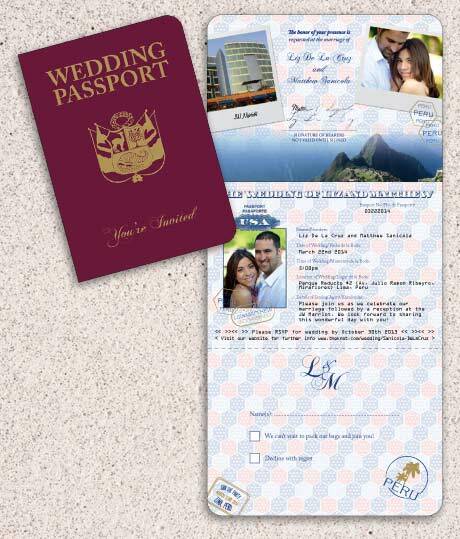 I love creating new Passport Invitations for different countries so if you're getting married abroad please contact me to discuss unqiue ideas for your big day. I've created Passports for all sorts of destinations including Canada, Australia, Switzerland, Mexico, USA, Kenya, Malta, Ireland, Japan, India, France, Spain.... the list goes on! This Peru Passport Invitation was great fun to work on and can easily be customised to suit your theme or wedding venue so please don't hesitate to get in touch with your ideas.